Voice actors are constantly searching for the perfect DAW (Digital Audio Workstation). Itâ€™s the software we rely on to record and edit auditions and produce complete voiceover projects. There is much debate about which DAW is best for VO purposes, but Mac users have fewer options than their PC counterparts. Adobe will soon give Apple fans a new option that PC users have been utilizing for years. Itâ€™s called Adobe Audition. 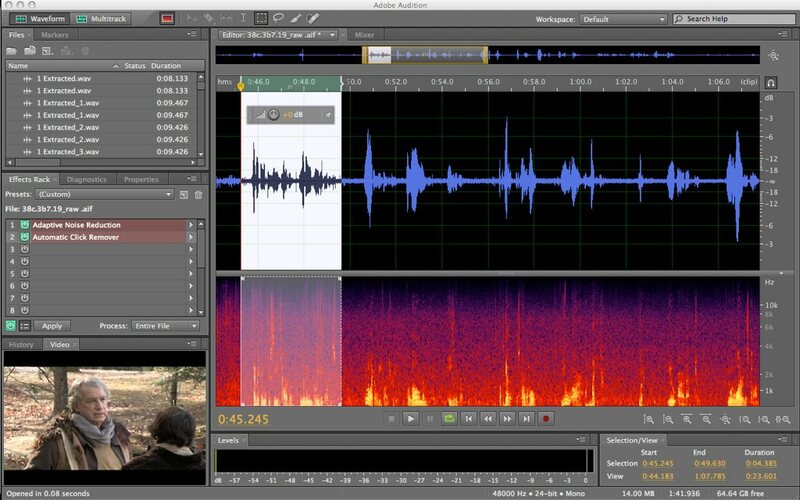 Formerly known as Cool Edit Pro (before Adobe bought it), Audition has been the DAW of choice for radio production and newsrooms across the country. Audition for the Mac has been released to the general public in beta form. Adobe is allowing people to try it out in return for their feedback on its forums. Audition works with just about any digital audio interface you can throw at it. All you have to do is choose your device in the preferences menu under audio hardware. Once your hardware is setup you can begin recording. Recording is almost self-explanatory because Auditionâ€™s interface is clean and easy to understand. But you do have to take an extra step to set your levels. It involves clicking on the view drop-down menu, sliding down to metering and clicking on meter input signal. I donâ€™t remember having to do this in the old Cool Edit Pro. Editing in Audition is a breeze. The intuitive interface allows you to quickly edit waveforms. Once youâ€™re done editing you have to click file then save. This is where you can choose the location of your file and the format (.aiff, .mp3, .mov and .wav). One feature I miss from the old PC version was its ability to save your recordings when the software crashes. Believe me, it was a necessary feature in Cool Edit Pro. But after several months of intense usage the software hasnâ€™t crashed on me yet. I donâ€™t know if Adobe deserves the credit or if itâ€™s just my trusty â€˜ole MacBook Pro. I have encountered one serious bug, however. I couldnâ€™t record or playback files at one point. But the staff on the Adobe forums site quickly solved my problem by having me delete a preferences folder. This is, of course, to be expected in a beta release. Hopefully, Adobe will rectify this in the final release. All in all I have enjoyed recording and editing inside Adobe Audition because it is a familiar tool. But for newcomers the learning curve shouldnâ€™t be very steep at all. Itâ€™s definitely worth giving it a shot. After all, you canâ€™t beat its current free status. Happy editing! I use audition now for a while. And it's fun too work with. I do have Audition 2.0 and Audition CS 5.5. The programm i use the most is still the 2.0. Why, the 2.0 has a CD Section and the CS 5.5 not. This i miss in the CS 5.5. But for the rest, I just love working with it. Its a combo of familiarity with any program combined with power of audio editing software that really makes it good. I wouldn't be any good in a space station, but I can tear it up on a go-kart.